Sometimes you want to take your herbs on the road with you. 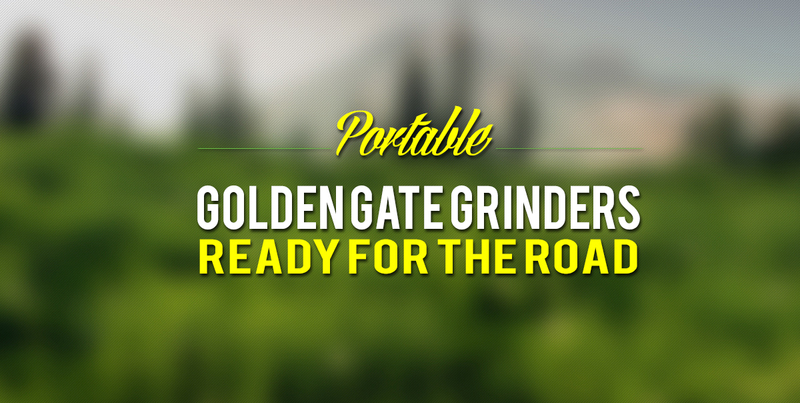 Did you know that Golden Gate Grinders are highly portable? Here’s a quick run-down just in case you haven’t heard: Our grinders are made from fully removable components. Unscrew the middle section, remove our handy pollen catcher, and you have a small, compact grinder. San Francisco, big beautiful city that it is, boasts of several nearby hiking spots. Wherever it is you call home, whether you’re 2 miles from Golden Gate Park or 2,000 miles away, Golden Gate Grinders has got you covered. Take your grinder and your favorite herbs for a refreshing walk in nature. If you’re a fellow urbanite, oceans and hillsides may not be the most accessible choice of adventure. Luckily, our grinders also make good companions for a bit of urban exploration. Graffiti hunting has become a popular pastime in recent years. Grab your grinder and a camera and discover parts of your city that you’ve never seen before. Herbal enthusiasts as a whole tend to be highly artistic people. Own it! The masters of old valued making art en plein air: real-time in open spaces. Whether you’re a writer, sketchbook artist, or an aspiring musician, take your personal show on the road. Your grinder can come along anywhere you get your inspiration. Sometimes you just have to get away. If you’re planning on making your great escape into the wilderness for the weekend, plan on taking your grinder with you. If you’re backpacking, we realize space is a limited commodity. Luckily, Golden Gate Grinders will fit into almost any pocket or nook with no trouble at all! You’ll be glad you brought it along while you’re sitting around the campfire in the cool, still night. It’s a big, beautiful world out there, and we’d like to come with you! A Golden Gate Grinder isn’t simply an investment for your home. It’s an investment for the rest of your busy, adventurous life. We promise, it’s so portable and convenient—you have no reason not to let your grinder tag along.